Plumbing, drain repair and septic tank issues at commercial buildings are bigger problems than amateur plumbers can handle. Take a moment to think about the potential damage to your business from the plumbing issue like loss of customers and delay in resuming operations. So it makes sense to solve the issue quickly and correctly the first time. If there is a dripping faucet in your office, if a sink is getting clogged or if a toilet is not flushing properly, call in a professional plumber immediately, in this case Roto-Rooter Plumbing and Drain Services of the High Desert, with offices in Victorville and Lancaster. 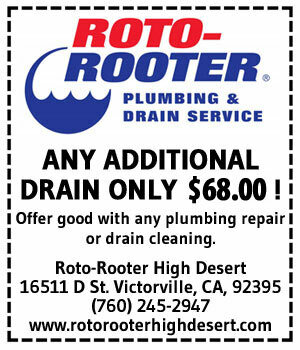 For many years, Victorville and Lancaster residents have called in Roto-Rooter for quality and affordable plumbing, drain cleaning as well as septic services and we have delivered every time. Roto-Rooter can undertake a wide variety of plumbing jobs, irrespective of how short the notice is. 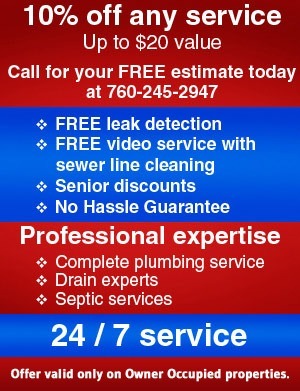 No matter how big or small a plumbing problem, we can help you. Our services include plumbing replacement and repair, water jetting with a high pressure pump, drain and sewer line inspections through video camera, drain and sewer cleaning as well as septic pumping. We have the latest equipment to conduct these operations and we will press them into service as needed, when we work on the plumbing, drain cleaning or septic repair job in your commercial premises. For more information on our commercial services, give us a call at (760) 245-2947. Our customer care agents will be glad to help you with your plumbing issues.